Shell marine lubricants on board 21*5,850 dwt VLCC 7.7 miles off the shore of San Pedro, California. Ann's speedy transfer of marine lubes. Hose lines from four individual bins at a time feed lubricants into twin 2-inch feeder lines lead- ing from Vicki Ann to the VLCC's bulk tanks. Vicki Ann's bulk bins. Time saver! Only 3 hours 50 mins. 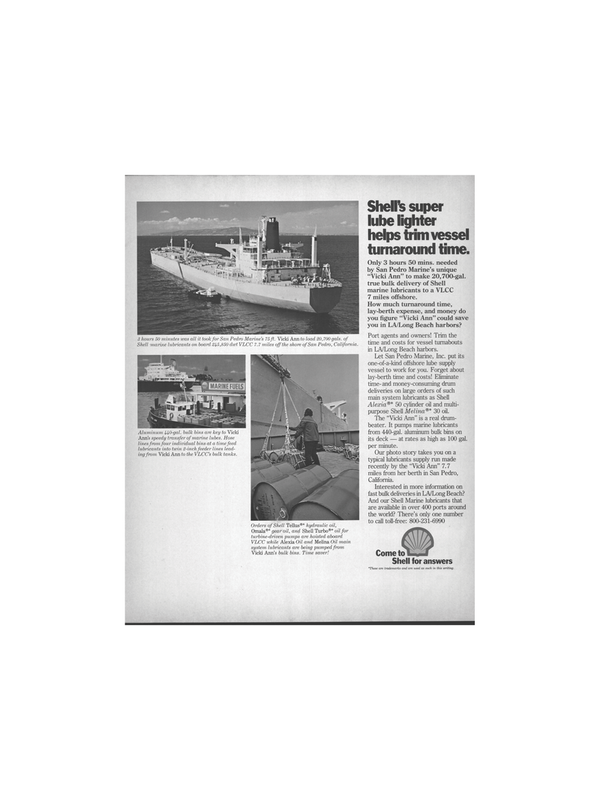 needed by San Pedro Marine's unique "Vicki Ann" to make 20,700-gal. true bulk delivery of Shell marine lubricants to a VLCC 7 miles offshore. How much turnaround time, lay-berth expense, and money do you figure "Vicki Ann" could save you in LA/Long Beach harbors? Port agents and owners! Trim the time and costs for vessel turnabouts in LA/Long Beach harbors. Alexia®* 50 cylinder oil and multi- purpose Shell Melina®* 30 oil. The "Vicki Ann" is a real drum- beater. It pumps marine lubricants from 440-gal. aluminum bulk bins on its deck — at rates as high as 100 gal. per minute. Interested in more information on fast bulk deliveries in LA/Long Beach?